As well as enjoying games such as Fox and rabbit, Where are you? 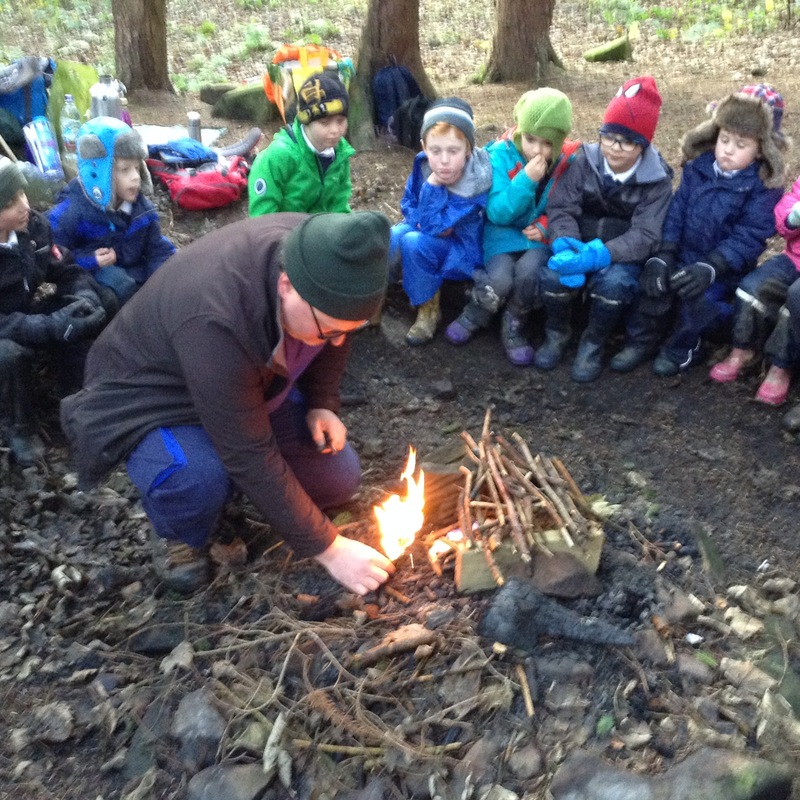 Hide and Seek and What time is it Mr Fox?’, the children reflect on where they live and who they are through a range of socialising activities such as sharing a warming hot chocolate by the fire, reflecting on the challenges that day and using a talking stick to play listening games. 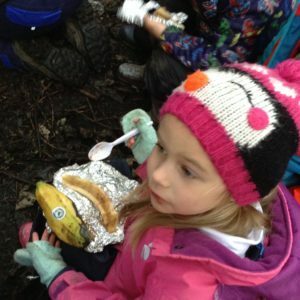 There is much to learn and remember at the start of the series of sessions – the simple ‘don’t eat, don’t squish, don’t take’ motto but ‘DO have fun and DO listen to each other and DO take care of the habitats’. The older children continued the ‘art in nature’ theme with sculpting clay, imagining, designing sculptures with Andy Goldsworthy as inspiration, boat design and testing, predicting, analysing, team building – making dens, whittling willow sticks, rope knots, obstacle courses, treasure hunts and of course whittling sticks for marshmallows. 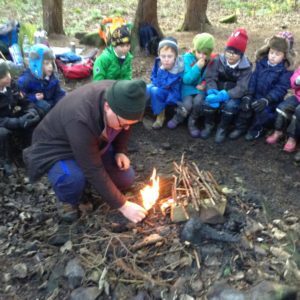 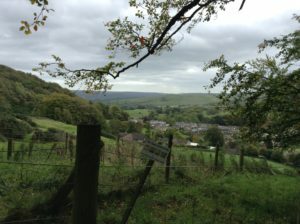 We have been lucky over the last two years to have been inspired by three experienced parents who were trained in Forest Schools and enthusiastically took our children out and up into the forest each week in rain, sun, snow and freezing temperatures as well as lead them on walks in the local area. 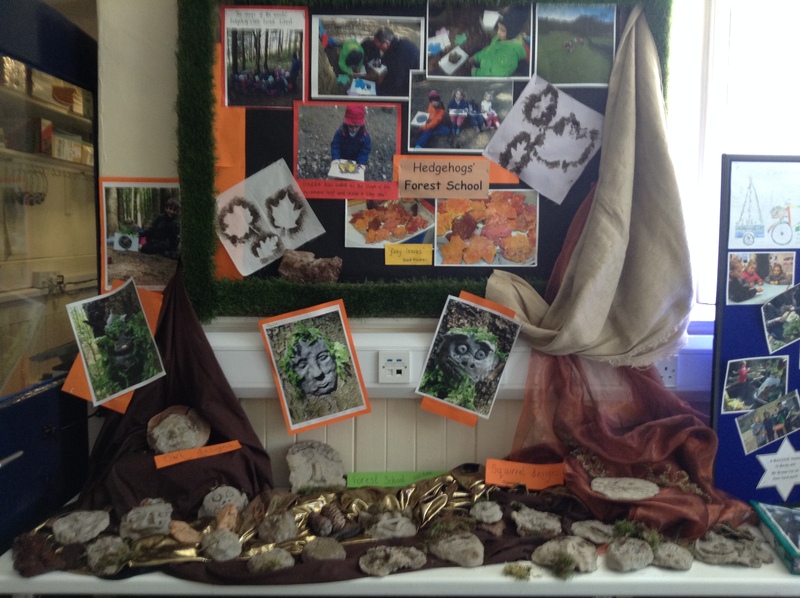 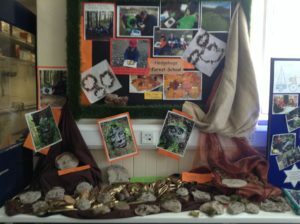 We love our forest school sessions and are pleased the Governors support this venture. 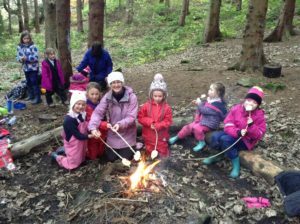 We now have our very own qualified Leader Mrs Jones, who has completed the MASSIVE training course and been awarded her own certificate – congratulations. 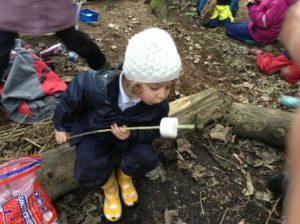 We are keen to ensure the opportunities continue for all our children to learn about each other, spend time in the fresh air and learn about the world in which we live as well as to encourage others to have a go at new challenges and use the outdoor space to enjoy games and have fun. 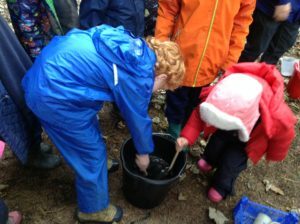 As well as promoting physical skills and a wider understanding of the world, our ethos is to offer all learners an opportunity to develop confidence, communication and concentration through hands on learning in our natural environment. 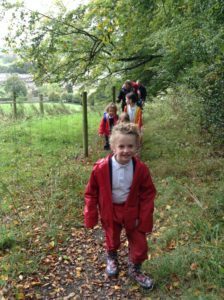 Autumn Term 2016 began with our youngest children taking to the outdoors in a big way – its a good km walk up quite a steep hill! We use a talking stick to take turns in circle time around the camp fire. 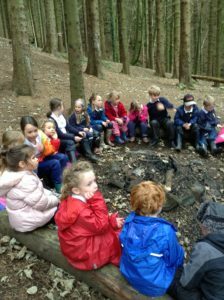 “We pass it around the circle and people get to talk about forest school, like the safety rules and what we’d like to do next time,” said Olivia. This term with our Hedgehog Class we have explored self portraits. 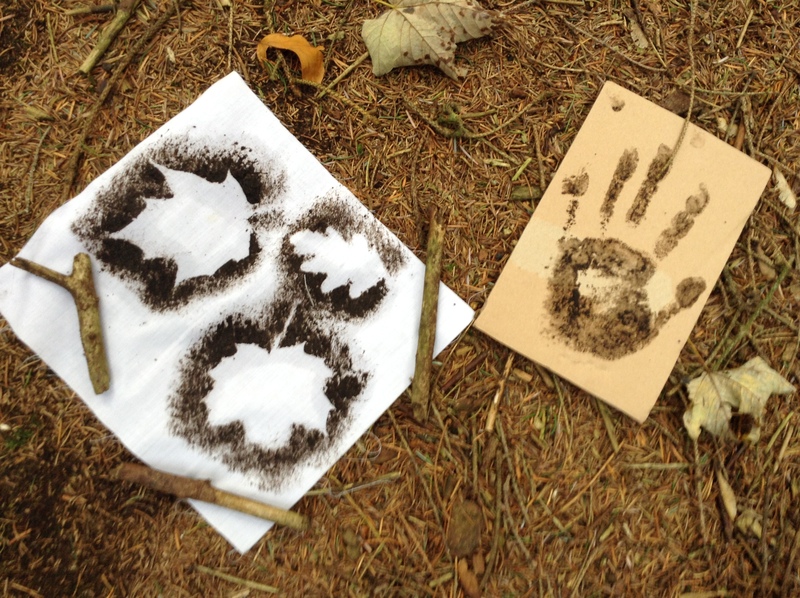 “We used sticks and leaves and teeny stones,” explained Theo. 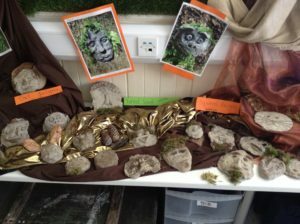 Look, who lives here? The children made a safe place to hide for a woodland creature – they needed shelter too. After reading the story of stone soup we’ve been making forest soup – the scissors and knives were sharp! 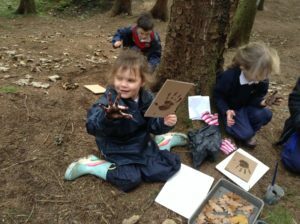 As our topic was water this half term we even made boats from the forest and floated them down the stream. “I liked my boat because it floated and it went fast! 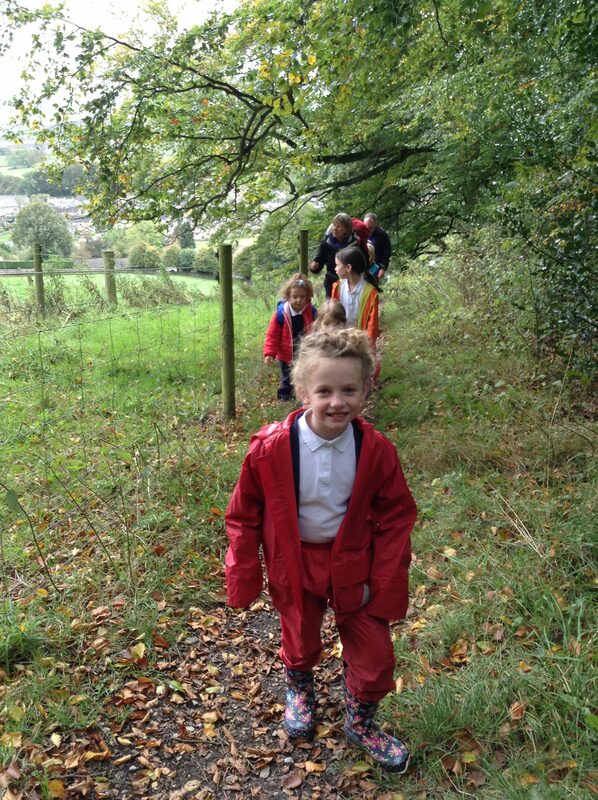 It made me feel happy!” said Holly.